Whilst sorting out my closet and trying to be stressed free, as possible ahead of the 5 days to go until the start of the spring and summer 2013 season and fashion night out. I thought it would be possible to let my hair down this weekend…. Sparkle away your weekend with Crystal Couture accessories. Crystal Couture offers accessories for Bridal, wedding, prom, eveningwear, Christmas party, and summer ball. Crystal’s accessories cover from high heels, boots, handbags, clutches, and purses. Let’s get down to the beat of the dance floor shall we? 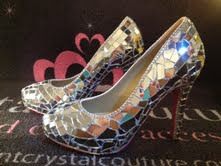 Crystal Couture’s shoe collection is an embellishment addition to any outfit or a statement of their own. Their shoe collection is based on themes and different materials. Firstly within Couture’s shoe closet is the candy floss peeptoes, these come in a two tonal hue of a touch of pink and white all on a crystal surface. Angel of pureness of the toes heels come in angelic palette, of bridal white in the materials of pearl and crystals. 6.5 inch heels is a must have in any shoe boutique. Yes pink and white peeptoes with a crystal heel. Finally reflect the fun on that dance floor girl! Crystal Couture’s mirror and glass platforms. Crystal accessories will take you from dust until dawn. So grab your favourite outfit and get your dancing shoes on girls!